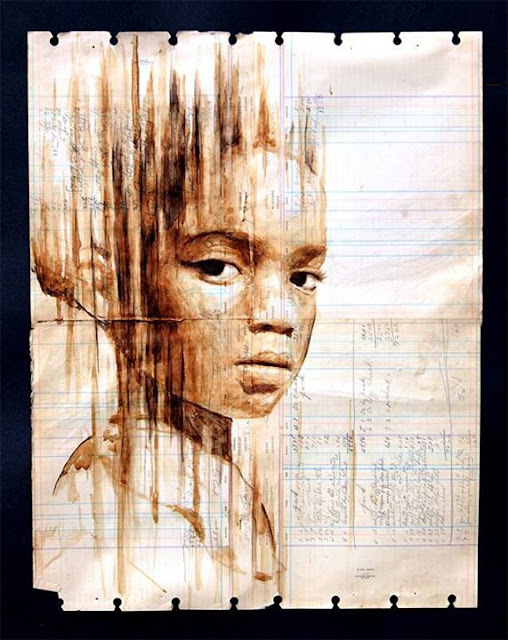 Coffee Painting of African Girl: Unknown Source, 2014. The world needs the creative strokes of our artists, singers, poets, and writers because their works express identity, beauty and meaning. Sometimes they pose questions and convey both the longing and lost-ness of mankind estranged from God. Art tells me God is real. Because all our art expresses either a longing for something more, or a lost-ness apart from God. God's irrevocable gift to us is our heart-mind-soul desire to create, imagine, invent, and express, in colours, shades, tones, words. We create because He created. Symphonies and poems, songs and murals, architecture and novels, show me this world is not a cosmic accident. Those who find true freedom of expression find it in God's boundless love. Without Him, all my music and art is chasing of the wind, sound and fury, fleeting happiness and deathly melancholy. Without Him, I am lost, no matter how cultured, educated, or artistic I am. My art stumbles with me through a purposeless lifetime into the hope-less grave. Oh but thank you God for Your Hope and Love and Reality! He is my portion. In Him my art finds fullest, truest, deepest, glorious meaning. With Him, I sail toward the endless shores of Eternity.